In order to issue a new Teudat Zehut you will need to visit your local branch of Misrad Hapnim (the Ministry of Interior). You must book an appointment at Misrad Hapnim for EACH person who needs a biometric Teudat Zehut. CLICK HERE to schedule an appointment at your local Misrad Hapnim. You must have an Israeli cell phone number to book the appointment, as they will SMS you with the appointment time. Your Teudat Zehut will be couriered to the home address listed for you in the Misrad Hapnim files 7-10 business days after you applied for it. If you are unable to provide sufficient proof of identity, you will not receive your Teudat Zehut on the spot and instead Misrad Hapnim will check their records and then mail your new Teudat Zehut to your home address. Important Note: If you need to replace a lost Sefach (addendum) and you have the physical Teudat Zehut with you, you can visit your local branch of Misrad Hapnim and issue a new Sefach free of charge. You will need to fill out a Teudat Zehut/Sefach Request Form as well as a Declaration of a Lost Teudat Zehut/Sefach. In order to issue a lost Teudat Oleh, you must first sign a declaration in front of a court clerk attesting to the fact that you lost the Teudat Oleh. On the form you will need to indicate any benefits which you may have used such as customs benefits or tax reductions. There is a 47 NIS processing fee for the court declaration. For a list of court locations (in Hebrew), see the following link. In order to request a new passport you will need to visit your local branch of Misrad Hapnim. You must book an appointment at Misrad Hapnim for EACH person who needs a biometric passport. Note: It is cheaper to purchase a new passport for someone below the age of 18 online. Please note: If your Passport/Teudat Maavar was stolen, you may request an exemption on the fee. The request must include a police report on the stolen Passport/Teudat Maavar. Visit your local branch of Misrad Harishui. You can pursue this option if you don’t have any limitations on the license and provided that your license has not been suspended or revoked. You will receive a temporary license/payment slip which you can pay at the bank or at your local post office. You may call Misrad Harishui’s automated phone system by dialing *5678 or 1-222-5678. 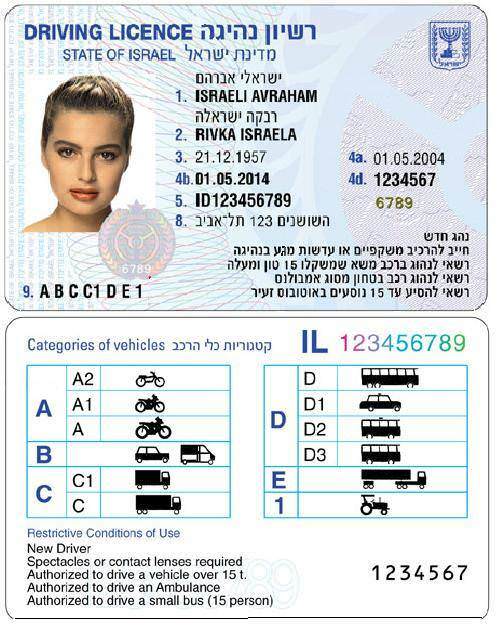 You may apply for the new license and pay via the payment site on www.gov.il. You may print a duplicate license using one of the Automated Licensing Machines. You must use a credit card with the name of the licensee ONLY. You can also pay the duplicate license fee on the Government Services payment app. For download to IOS (IPhone). Please note: If you opt to apply by phone or online, your temporary license will be sent to you by mail. This process is not recommended if you need the new license urgently. The temporary license is valid for several months. Your permanent driver’s license will be mailed to your home address. If you lose the “Note of Future Bank Account” which you received with your Teudat Oleh at the airport, there is no need to replace it. Instead, when you open your bank account, make sure to ask for an opening statement which lists your personal details and account number. Present the opening statement to your local branch of Misrad Haklita in order to arrange your Sal Klita payments. Note: If you do not register at the post office within 90 days of your Aliyah, you will need to visit your local branch of Bituach Leumi in order to register for health coverage. Contact the Embassy or Consulate of your country of origin to inquire about replacing a lost passport. *For emergencies outside of normal business hours ONLY (outside of Monday-Friday, 8:00AM to 4:30PM and holidays) you can contact the Consulate General at 02-622-7250.